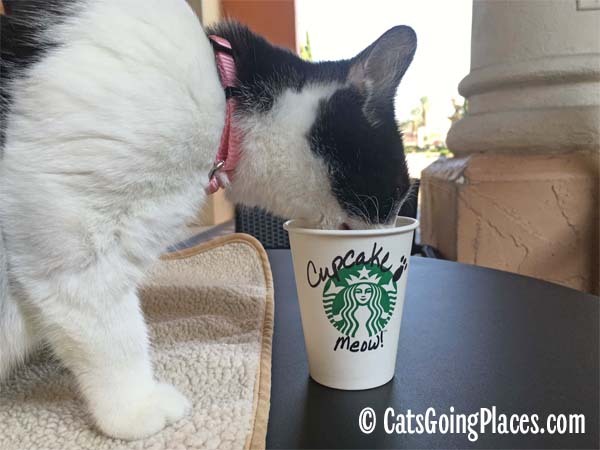 One of our favorite pet-friendly places to take Cupcake is Starbucks. 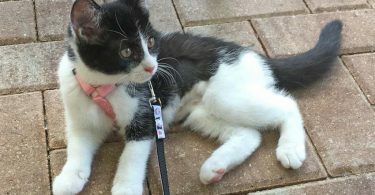 Starbucks across the US that have patios tend to welcome pets as long as their patios can be accessed from the outside and don’t require going through the store to get to them. With Starbucks serving food, they are subject to health regulations, which means the interior is a no pets zone. Hanging around on a patio isn’t a year-round thing for many locations because it gets too cold in the winter, but we’re fortunate in Florida to have plenty of warm days even through the coldest months. Going to Starbucks by yourself can be a challenge if you don’t have someone to go in with you while you stay outside with your cat. 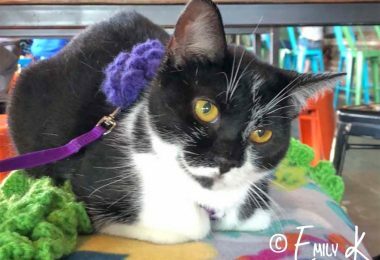 Thankfully, many Starbucks locations now have drive-thru service so you can pick up your order there, then take your coffee and your cat to the patio. Another option may be online ordering. The Starbucks app lets you order and pay online so all you have to do is run inside and pick up the premade drink from the designated location at the end of the coffee bar. 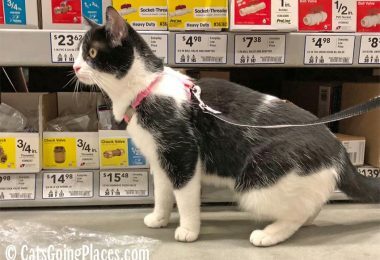 If your cat is OK in her carrier on the patio alone for long enough for you to walk inside and right back out, this can help you pick up a drink order when you don’t have someone else to walk in and get it for you. One of Cupcake’s favorite parts of visiting Starbucks is getting what they call a puppaccino. This is really a cup of whipped cream. Not every Starbucks location will make these, since they aren’t technically on the menu. From what I can tell, busy, urban locations with lots of dog visits are less likely to offer them because giving away that much whipped cream adds up. If that happens, you could order extra whipped cream for your drink on the side. I don’t Cupcake eat the whole thing, because there are a lot of calories in all that whipped cream. Sometimes she lets it sit a while and kind of melt before she sticks her face in the cup, resulting in a big mess in her whiskers and on the fur of her face. Having cat-safe wipes on hand can be really handy to help her clean up from messes like these! Either way, I always make sure to bring along some kind of treat I know Cupcake likes, usually freeze-dried chicken. 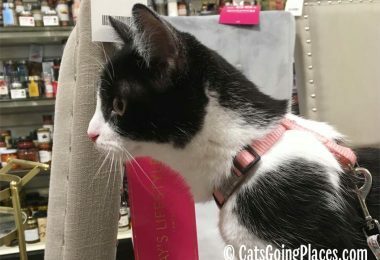 This gives her motivation when we ask her to give a stranger a high paw, and it’s also nice to use as positive reinforcement when she is especially brave when something noisy or alarming happens. Cupcake isn’t just there to eat, though. It’s a great social opportunity for her. She meets and greets lots of people there. Regular customers stop by to say hello to her, and baristas come out to visit when they have a break or finish their shift. Since our favorite Starbucks patio is near a tourist area, she also gets to meet a lot of tourists from all around the world. 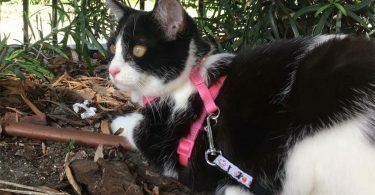 The tourists are usually in town to visit Disney World, but all of them miss their cats at home, especially the visitors from overseas who are here on extended vacations. They love to pet Cupcake and tell us all about their cats back home. 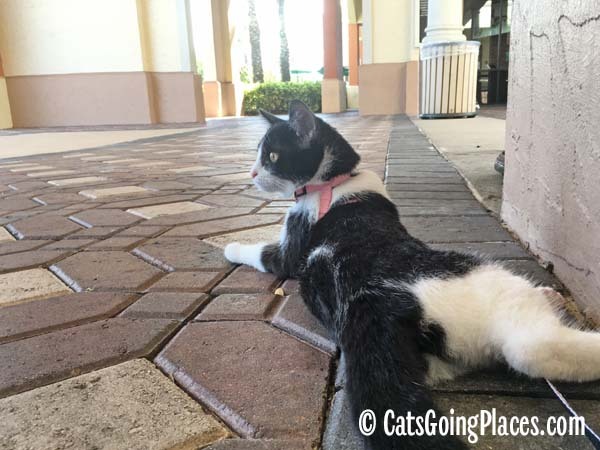 Cupcake prefers a patio that is not too close to where cars drive past. One of our nearby Starbucks is in a strip mall, and its only tables are on the sidewalk directly in front of the store, with cars able to drive right past the sidewalk. This is her least favorite Starbucks, despite its patrons being a mix of mostly local residents who love seeing her there. Opt instead for a patio where there is some kind of buffer between the patio tables and the traffic, if possible. Even a row of parking spaces gives a buffer that helps Cupcake feel less wary of traffic so she can enjoy the visit much more. 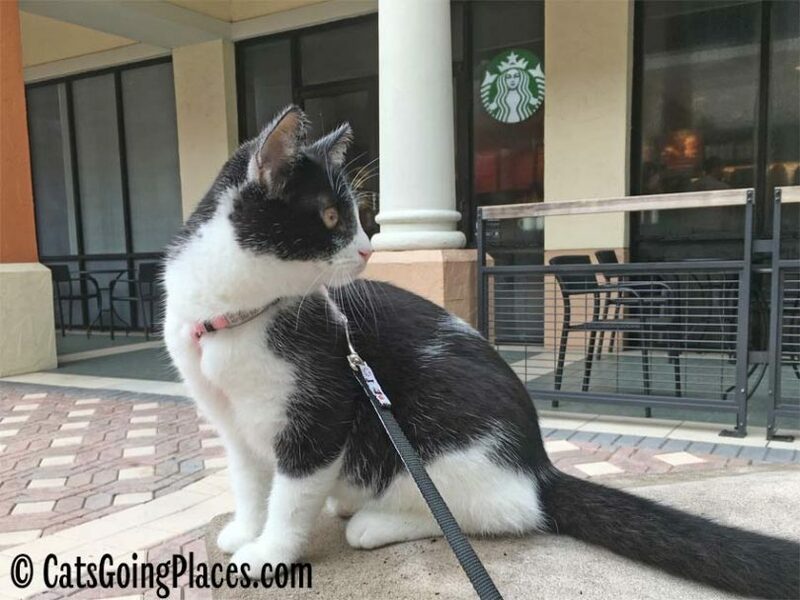 Have you ever visited a Starbucks with your cat? 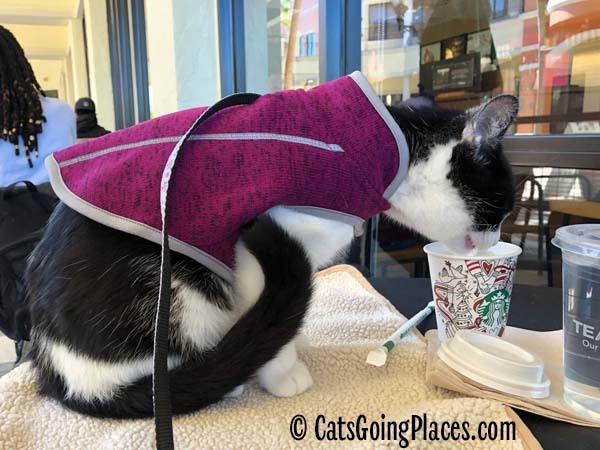 Chanel enjoyed our local Starbucks….can’t wait for spring cause patios are too cold in winter in Ohio. Hi, Wiki! Thanks for the kind words. It’s great to get to know you! We do have an email system set up to notify you when there is a new article on the web site.  See the box at right labeled “Get Cats Going Places by Email.” Thanks for asking, and we look forward to sharing lots of information with you in the future.